Health Care Current: May 10, 2016 has been added to your bookmarks. Health Care Current: May 10, 2016 has been removed from your bookmarks. How will the future unfold for health care in the US? While no one can predict how rapidly the industry will change over the next years and decades, major transformation is in the offing. This week, leaders from across the US life sciences and health care industry will join Deloitte at the Financial Times (FT) US Healthcare & Life Sciences Summit to tackle this question that has become so foundational to health care. While the science of health care has evolved over time, the business of health care has been fairly constant. But, over the past decade, we have begun to witness a transformation that has been marked by a delicate balance of drivers and constraints – trends being seen across the globe as organizations attempt to derive greater value out of technology and innovation while reining in costs. And what are we getting for that spending in the US? Today, more US health care dollars are tied to value than in prior years. Many organizations are focusing on transitioning health care from the “break-fix” model to one focused on prevention, predictive maintenance, and outcome optimization. We can already see the initial outcomes of this work. New partners are emerging: leading organizations are joining forces with public and private sector entities to tackle health care’s problems head on. And, organizations that have prioritized value – from leadership to the front lines – have begun to transform their approach to care delivery. These organizations are moving away from department- and specialty driven care to multidisciplinary- and multispecialty-driven care, from a focus on episodes and high-acuity to a focus on disease and cross-continuum care, from provider-centric to patient-centric experiences, and from orientation around individual physicians to a focus on teams for care delivery, involving multiple specialties, mid-level providers, social workers, and more. Where will we go from here? For one, consumerism in health care may trigger the industry to change even more rapidly than before. Awakened by consumer-driven trends in other industries and also driven by high deductibles and high co-pays, many health care consumers are beginning to seek out organizations that approach health care with the same technological and value-driven focus as the financial and consumer products industries. In that vein, new ventures, such as Harken Health, Oscar, and Iora Health, are shaking up traditional business models and placing the consumer at the forefront. This focus on value has also caused many health care systems to take a fresh view of how to best manage financial risk and assure themselves of a steady or growing market share. A growing share of providers sponsoring plans are focused on the converging trends of financing and care innovation. And finally, as health care stakeholders pore over draft regulations for the Medicare Access and CHIP Reauthorization Act of 2015 (MACRA), the new strategies for physician payment in Medicare will fuel growth and changes across the system. We are not too far out from January 1, 2017, when physicians will be faced with a decision: join into alternative payment models (APMs) or go the path of the Merit-Based Incentive Payment System (MIPS). Either route presents physicians and other health care organizations with many operational and financial decisions – all focused on value. No one can predict how the health care industry will look 50 years from now. Indeed, few can accurately anticipate what changes we might see over the next year. How the future may look hinges on a complex system of evolving drivers. What is certain is that now more than ever, the industry is intently focused on getting real value out of the dollars we spend on health care. Last week, the US Centers for Medicare and Medicaid Services (CMS) published the first annual Quality Measure Development Plan (MDP). MACRA requires CMS to develop the MDP. It will serve as a guide for CMS, clinicians, and other stakeholders to continually update quality measures used in MIPS and Advanced APMs. The MDP must be published by November 1 every year starting in 2016. For MIPS, the MDP will develop measures for the quality performance measure category (the other three are resource use, clinical practice improvement activities, and advancing care information). Advanced APMs must use quality measures comparable to those in MIPS, so the MDP work on the MIPS quality measures will affect APMs as well. CMS will address gaps in quality measures through the MDP. One goal will be to develop more measures that can apply to clinicians in any specialty. Patient safety, care coordination, and affordable care are all areas in which CMS says there is considerable variation in clinician performance. CMS will update the MDP annually, as required by MACRA. This first report incorporates feedback from 210 individuals and groups. CMS will conduct a five-state pilot of a new Quality Rating System (QRS), which will give star ratings to health plans on the federal exchanges. Consumers in Michigan, Ohio, Pennsylvania, Virginia, and Wisconsin will see the ratings on HealthCare.gov during the 2017 open enrollment period, which begins on November 1, 2016. CMS plans to launch the program nationally in 2018. CMS selected these five states because they have a large number of health plans participating in the exchanges. While CMS is limiting the displays on HealthCare.gov to these five states, it will allow state-based exchanges to display quality rating information on their websites during the 2017 open enrollment period. The pilot approach is consistent with other consumer-facing tools that CMS has introduced on HealthCare.gov. Last year, CMS added a tool for potential enrollees to search for providers in their network. CMS can add consumer user and experience testing and obtain feedback before expanding them to all states in HealthCare.gov. States will have until 2019 to switch to an online platform to enroll people in the Small Business Health Options Program (SHOP) exchanges. In guidance last week, CMS also clarified that states can explore additional options for structuring and sourcing of their platforms, including sharing IT platforms with other states. CMS said that other options for platforms would include ones maintained by third party administrators. Analysts say this could allow states to leverage private exchange (PIX) technology and infrastructure. PIXs may help states reduce costs, administrative burden, and the complexities of maintaining individual eligibility, enrollment, and SHOP platforms. SHOP exchanges provide coverage for employers with 50 or fewer full-time employees and as of May 2015, had approximately 85,000 people enrolled. Related: The Deloitte Center for Health Solutions analysis of the 2015 Survey of US Employers found that employers are increasingly using PIXs to provide health benefits to their employees. Many say that PIXs can lower their costs and simplify the employer’s role as benefit administrator without sacrificing coverage levels. Many employer respondents that had already adopted a PIX agreed that it helped control their costs and that they were satisfied with their PIX. Most non-adopter employers reported that they were likely to use a PIX for their business within the next five years. The Physician-Focused Payment Model Technical Advisory Committee (PTAC) met last week to discuss MACRA and gather provider feedback, questions, and potential concerns. The committee provided attendees with guidance on how to submit physician-focused payment model (PFMPs) ideas for CMS to consider. PTAC encouraged clinicians to submit formal comments and to use the committee as a resource when preparing their PFMP submissions. The committee also discussed the migration from Meaningful Use standards to the more flexible system of Advancing Care Information. The committee aims to assure clinicians that the new guidelines will not stifle their potential to innovate within the system, emphasizing that the new system has more flexibility and allows for more clinician input. If CMS confirms that a PRPM meets these conditions, after testing, it would be considered an advanced APM under MACRA. PTAC is an independent advisory body established to help review proposals for new payment and delivery models. The group is working to develop bylaws and rules of engagement for reviewing proposals, as well as a methodology for scoring proposals. The Treasury Inspector General for Tax Administration (TIGTA) audited the Internal Revenue Services (IRS) processes for identifying and issuing the premium tax credits (PTCs) and found that the IRS was accurate 93 percent of the time. 4,672 were not under the authority of the IRS to correct upon review. Background: The IRS issues PTCs to low-and-moderate income individuals enrolled in the public health insurance exchanges. Exchange enrollees can claim their tax credits directly on their returns or in advance through APTCs. The IRS reconciles APTCs when people file their taxes. PTCs are available through both the federally facilitated and state-based exchanges and each household is responsible for determining the applicable level of PTC at the time of enrollment. The US Food and Drug Administration (FDA) and the European Medicines Agency (EMA) are looking into how the two agencies can strengthen communications on the development and approval of new drugs. This communication would occur using two frameworks that the FDA and EMA operate: the breakthrough therapy designation in the US and the Priority Medicines (PRIME) scheme in the EU. In the US, the FDA grants breakthrough therapy designation to a drug if it is intended to, alone or in combination with one or more other drugs, to treat a serious or life threatening disease or condition, and if preliminary clinical evidence demonstrates results. PRIME allows the EMA to offer early and proactive support to drug developers of promising medicines to speed up the development and evaluation process. While this effort requires navigating confidentiality and legal hurdles between the FDA and EMA, the two share a common goal of getting innovative medicines to patients. This strategy to improve collaboration could be a way to reach this goal more efficiently. Related: As described in Next frontier of drug development and approval: Will regulatory agencies align in moving policies forward?, future progress in biopharma research and development (R&D) hinges, in part, on reducing regulatory uncertainties. Biopharma companies and regulatory agencies around the world are continually exploring ways to evolve their processes, programs, and standards to reflect new scientific and evidentiary models for drug development. This report examines three areas that stakeholders may consider to support the drug development and approval process: benefit-risk assessment, patient-reported outcomes, and real-world evidence. If biopharma companies, regulators, and policymakers find common ground in these three areas, this could enable a smoother pathway to the next frontier of drug development and approval. Lawmakers in both chambers of Congress have introduced legislation to remove from the Hospital Value-Based Purchasing (HVBP) program measures that gauge patients’ perceptions on how well hospitals helped control pain. Lawmakers and other stakeholders have said that attaching financial incentives to pain management may be contributing to the over prescribing of opioids. The bipartisan Promoting Responsible Opioid Prescribing (PROP) Act would remove hospitals’ scores on survey responses regarding pain management from the financial incentive program. Higher HVBP scores lead to greater payments. The American Hospital Association’s Vice President for Quality and Patient Safety Policy, Nancy Foster, said that including these questions on the survey sets patient expectations about medication for pain and pressures physicians to prescribe them. Opioid overprescribing and the resulting addiction and abuse have been in focus for the last several months. This comes shortly after three House committees voted to advance legislation regarding opioid abuse (see the May 3, 2016 Health Care Current). 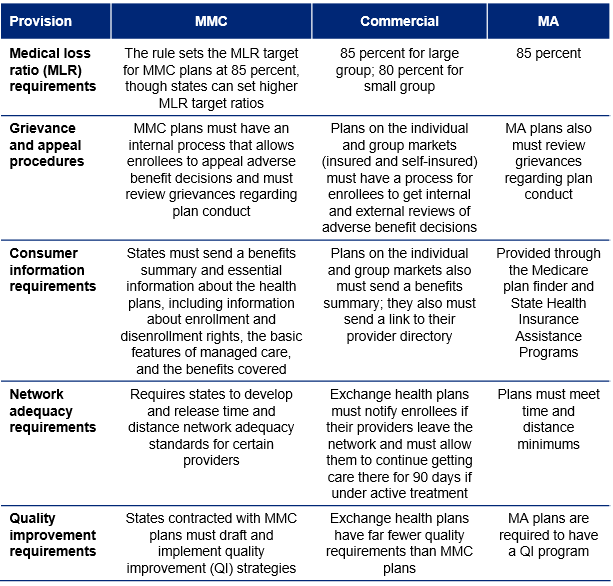 Health Affairs recently released an analysis comparing the new requirements for MMC plans to those for QHP and MA plans. Researchers used data from 2000-2009 and accounted for time, region, total spending, and state demographic and economic characteristics to measure the differences. Using multivariate models, researchers found that states with higher social to health spending ratios had significantly better health outcomes the next year. States with higher ratios also had better outcomes than states with lower ratios when they looked at outcomes two years later. Background: Researchers used data from the National Health Expenditures to look at health care spending; public health and social service spending by state came from the Census Bureau; and prevalence and costly conditions data from the US Centers for Disease Control and Prevention. Malawi is testing a program that uses drones to increase access to HIV testing in babies. High costs and inaccessible roads in remote areas are a few reasons HIV testing and diagnosis may be slow and delay access to antiretroviral treatment. Malawi has one of the highest rates of HIV in the world, with 10 percent of Malawians affected. The United Nations' (UN) children's agency, UNICEF, partnered with US-based drone company Matternet to create a program that allows drones to pick up blood samples from local health centers and deliver them to specialist laboratories that can test them. There are only eight laboratories that can test for HIV across the country, which has a population of more than 16 million. UNICEF estimates that about 40,000 babies were born to HIV positive mothers in 2014. Around 10,000 children die of the virus every year, but early diagnosis and quality care could reduce that number. Researchers are hoping that drones will be faster and more efficient than the current method of having motorbike couriers transport samples. Motorbikes can make the roundtrip to get samples from health care centers to the laboratory and return the results in about two months; the program aims to reduce that timeframe. Before launching the program, the researchers are starting with simulated samples. To date, a successful test flight has traveled 10 km from a community health center to a hospital laboratory in the country’s capital. The program plans for health workers to be able to operate the drones using a password and GPS signal from their mobile phones. Though the initial cost for drones is significantly more than motorbikes, inexpensive battery charging costs make drones cheaper in the long run. Analysis: Drones may offer a less expensive, faster, and more efficient method to get to hard-to-reach patients in rural areas, areas hit by a disaster, or remote areas in other countries. Underdeveloped infrastructure and vast distances to remote communities can make getting medications and services to patients a significant challenge. Drones have been used for surveillance and assessments of disasters, but this may be the first program to use drones to improve HIV services. Many startups and major retailers and the federal government are taking note and exploring the potential for drones in health care and beyond. In addition to Matternet, a Silicon Valley start-up called Zipline International is partnering with the Rwandan government to establish medical services using drones in that country. After identifying what medical supplies are needed for a patient or clinic, Zipline will receive an order by central depot and deploy the drone. The package will be airdropped and the drone will return to base. The partnership will start with Zipline delivering blood-related products for 20 health facilities with plans to extend in the coming months. As drone technology becomes more widespread and cost-effective, many researchers behind these types of experiments are hoping they may revolutionize access to medical care and provide aid in humanitarian crises in the US and beyond.